HERE IS A SAMPLE OF OUR NEC RANGE OF DISPLAYS GIVING YOU A SLIGHT TASTE OF WHAT WE HAVE TO OFFER. Entry-level Format displays - 32" - 90"
Affordable digital signage applications with impressive screen performance. VALUE RANGE - 32" - 80"
Discover our range of affordable and cost-effective display monitors, with reliable high performance results. PRO RANGE - 40" - 80"
For professional digital signage with stunning visual impact, turn to our Professional display monitor range. XTREME RANGE - 40" - 75"
Advanced features for advanced functionality, our Xtreme range is designed to take your public displays into the future. TOUCH SCREEN RANGE - 42" - 80"
Our range of interactive touch screen displays helps your audience find information at their fingertips. Our NEC range is recommended for the retail, hospitality, medical and education industry for its superior quality, functionality, pricing and warranties. 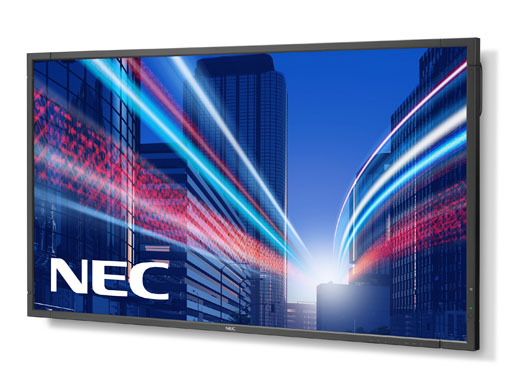 Project pricing is available for all of our NEC range through Amped Digital.